How do concepts change? According to the usual view, Anglophone and Continental studies have developed incompatible paradigms on this topic. 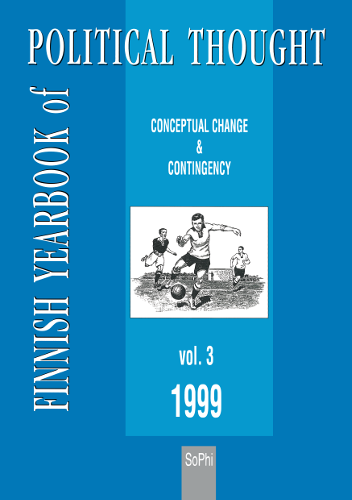 In the Finnish Yearbook of Political Thought 1999, this view is relativised from different perspectives by Melvin Richter, Janet Coleman and Kari Palonen. In particular, Quentin Skinner assesses his own intellectual development, explicitly refutes the view that he denies the possibility of a conceptual history “as such”, and also sketches his own rhetorical perspective on conceptual change. How are we to deal with contingency? Are novels better in understanding the contingency of politics than political science? This is a claim made by two of the contributors to this volume. Maureen Whitebrook combines a political reading of two contemporary novels with the discussion of contingency in contemporary Anglophone political theory, and John S. Nelson argues that by reading John le Carré's novels we can learn of international political practices. Risto Eräsaari, however, tries to incorporate contingency into a socio-political Zeitdiagnose. In the “Finnish section” Eeva Aarnio and Kyösti Pekonen analyse the Finnish party programmes, and Mikko Salmela scrutinises Finnish philosophers’ views on totalitarianism during World War II.